I feel like I know you, that perhaps I am one of the close friends you mention in your book. And I felt this way from the first page (or maybe even earlier dipping in and out of your blog), but of course I’ve never met you. This is simply the effect your words and thoughts have had on me. I’m actually pretty low hanging fruit, in marketing terms, for the promotion and sale of your book. Never one to be deterred by a sad tale and, similarly, always on the lookout for a true story full of moral and some life wisdom, I requested an advance copy from your publicist at William Collins so that I could read it (and review) over the Christmas break. I promptly devoured it in about three sittings. I shed tears, but only on occasions as your story is full of joy – as you explain your life rationale. Discovering how the Nuisance (as you call it) had taken over your very existence but turning this around to highlight what you realised you really love about this world, is powerful, inspiring and curiously gladdening. With your beyond-impressive drive and career achievements combined with refreshingly honest descriptions of marriage and motherhood, your words fully establish you a leader and influencer. And one who deserves huge credit and respect. Too many of us have an overwhelming fear of life being taken from us. But how can we live with the finality of death looming over us? As your tale so clearly points out, this is often an uncontrollable act and, at various crossroads of our lives, utterly inevitable. Your logically well laid plans fill me with comfort and I completely understand your desire and need to read and write (my 2 favourite pastimes) in any precious time remaining. Thank goodness you have put your thoughts down on paper. Thank goodness you have taken the time and given us your energy. With dignity and wit, you have taken us with you to the end of your life. On behalf of all who feel like me, thank you for your inmost thoughts, for making your reader feel like your friend and for giving us this life bible. I hope to meet you one day in another life. Kate Gross was 36 years old when she died from colon cancer on Christmas day at her home in Cambridge. Before her cancer, Kate read English at Oxford University. She joined the civil service and worked in Number 10 Downing Street for Tony Blair and Gordon Brown. On leaving, she set up the Africa Governance Initiative, a charity which works to rebuild structures of Government in post-conflict Africa. She was awarded an OBE in 2014 for her work. She blogged about her cancer at kateelizabethgross.wordpress.com and wrote there in more medical detail than she does in her book which is almost entirely free of any medical jargon or writing on the nature of cancer. It is a book instead about life. She is survived by her husband Billy and their five year old sons Isaac and Oscar. 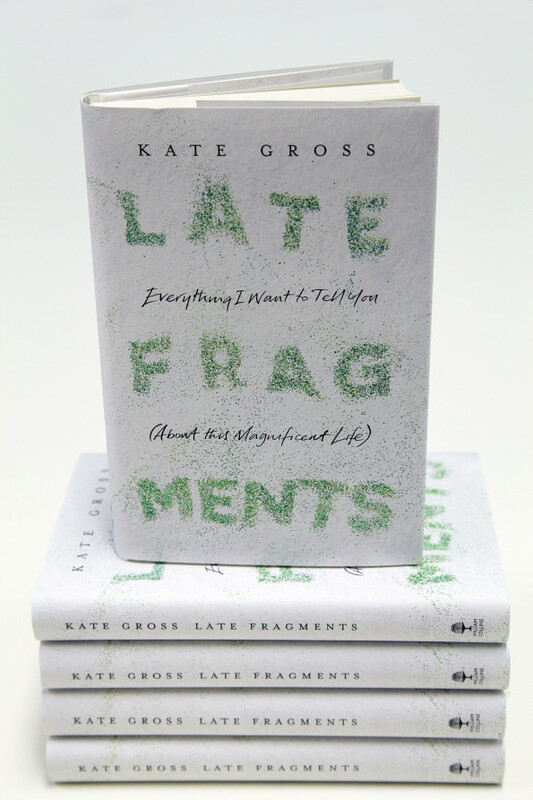 Kate’s book LATE FRAGMENTS is now on sale. I love the way you wrote this in a response to Kate, it really worked. I just reviewed this book for my blog too (here’s a link if you’re interested: http://readbyjess.blogspot.co.uk/2016/06/review-late-fragments-everything-i-want.html) and also found it both inspiring and heart-breaking. There are few books which prompt such a direct response and I found yours quite moving to read.